Future passions are often formed by childhood experiences. For Joshua Chan, a particular kind of fishing has spawned concern for the marine environment. For years, my dad and I would meet Rob at the jetty and other fellow poke pole enthusiasts. Often, he would look up and point out the humpbacks soaring over the horizon and the dolphins prancing along the waves. On some days, he invited us to his home adorned with abalone shells, where he prepared a hearty meal of fresh caught eel fillets served with his garden vegetables. It became obvious that the ocean was his home. Over the years, the water we fished on was noticeably muddier. Oil pools from the boat formed around the rocks that we fished on, and plastic bottles and trash floated in clusters. Without saying a word, Rob looked on and wiped his brow in disbelief. He was gradually seeing his home intruded upon and destroyed. This year, as my high school’s community service representative, I was tasked to create an service event. Instinctually, I thought of Rob and our poke pole fishing community and arranged a “Coastal Cleanup”, where we picked up trash and recorded data while raising awareness about the effect of pollution on our marine ecosystem. The poke pole fishing community has remained a nurturing home of passionate fishermen who share their joy and love of the ocean community. For Rob and future young generations of poke polers, I want to make sure we keep it that way. With a Perspective, I’m Joshua Chan. 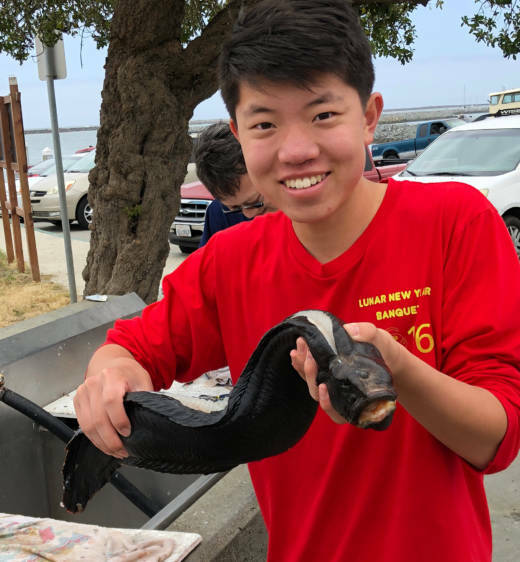 Joshua Chan is a senior at Crystal Springs Upland School and a budding environmental sociologist searching for a compromise between consumerism and marine protection.